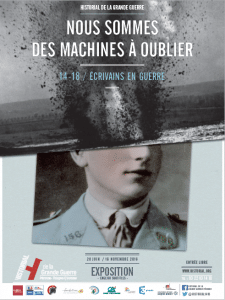 From 28 June to 16 November 2016, the Historial of the Great War is hosting an exceptional and captivating exhibition about the writers in war, created by Laurence Campa and Philippe Pigeard. This exhibition uses literature to transport visitors to the very heart of the First World War. In an innovative and unique setting, visitors will journey through the psychological and artistic worlds of those that experienced war, from near or from far, from the front lines to the rear, and from the eve of the conflict to its aftermath when the experience of war continued to mobilise literature. The exhibition touches on the lives and work of great avant-guard French, German and British authors, such as Blaise Cendrars, Ernst Jünger, Guillaume Apollinaire, Siegfried Sassoon, Ivor Gurney, August Stramm, Pierre Mac Orlan, Jacques Vaché and Joë Bousquet, to name but a few. The display presents a chronological, thematic and polyphonic view of the most deadly war in history. The protagonists of the pre-war literary and intellectual world, who encountered one another and exchanged views in a Europe that was fully open to culture and creativity, were suddenly, like millions of other men, catapulted into the brutality of an interminable, industrial and total war. Nevertheless, their intellectual connections and affinity survived and was resumed in the creative effervescence that occurred after the war. Thanks to their collections and to some thirty French and international, private and public lenders, the exhibition displays documents, manuscripts, rare editions, photographs and artefacts to reveal the strength and susceptibility of the writing in order to translate the daily life of war, to express the conscientious experience of a historic and extremely traumatic event, the rupture with the old world and in search of a meaning to the tragedy experienced on both sides of No Man’s Land. 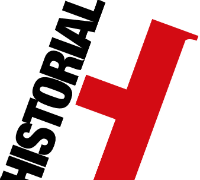 https://www.historial.fr/wp-content/uploads/2016/06/logo-historial-header-375-150.png 0 0 Historial https://www.historial.fr/wp-content/uploads/2016/06/logo-historial-header-375-150.png Historial2016-06-28 15:57:532016-06-28 15:57:53"Nous sommes des machines à oublier"